Military operations against Boko Haram in the past few years seem to have affected its ability to carry out high-impact attacks. As our graph illustrates, Boko Haram has been able to maintain a steady tempo of attacks this year. Reports in the Nigerian and international press of a ‘resurgence’ of Boko Haram attacks in the past couple of months are somewhat misleading. Our data shows an increase in the frequency of attacks in northeastern Nigeria this year compared with 2016 – with an average of 13.4 attacks a month so far. However, attacks in the northeast this year have become much less impactful compared with previous years. Military operations against Boko Haram in the past few years seem to have affected its ability to carry out high-impact attacks. 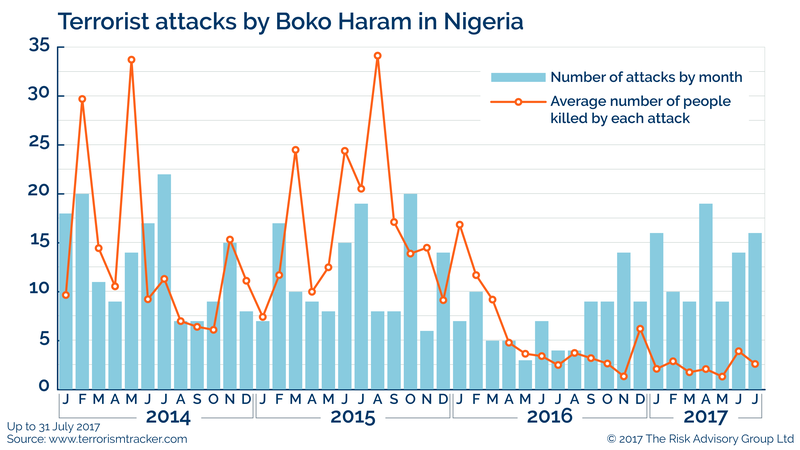 As the below graph illustrates, Boko Haram has been able to maintain a steady tempo of attacks this year. The monthly average of 13.4 attacks so far in 2017, compares with 7.4 attacks a month in 2016. The group mounted 19 attacks in April, the most in a single month since October 2015. But Boko Haram’s attacks have become significantly less deadly. The group has killed an average of 2.4 people in each of its attacks this year. This is compared with 5.8 per attack last year and 16.7 in 2015. The reason for this decline in deadliness is difficult to determine, but our data suggests that the group’s capability to build large explosive devices has diminished. This seems to have led to a shift in tactics. The group has mounted more attacks using person-borne explosive devices this year compared with previous years, where most incidents were either armed attacks or bombings using static devices. Indeed, there were more person-borne bombings between January and July this year (56 attacks) than the group mounted in all of 2016 (31 attacks). Most person-borne bombings by Boko Haram this year have tended to target poorly-secured locations, such as refugee camps. The low lethality of such attacks suggests that they have been conducted using crude and poorly-made devices. We suspect that this change in tactics and diminished capability is probably because military operations against the group have degraded its networks, expertise and manpower, and hence its ability mount complex and high-impact attacks. As we have previously noted in our reports, military action against Boko Haram has also eroded its ability to mount attacks outside northern Adamawa, and Borno, Gombe and Yobe states. The last attack outside these areas was in November 2015. But despite this, and the group’s apparent difficulties in mounting complex attacks, it seems almost certain that it will continue to mount frequent low-impact attacks in northeastern Nigeria for the foreseeable future. We are monitoring for signs that the group is becoming more capable of mounting attacks outside the northeast, and that it is able to mount more high-impact attacks. An increased ability to mount more complex attacks in northeastern Nigeria would be one such indication. As would arrests or foiled plots in Abuja or Lagos. We have not seen any such signs in the past year at least.